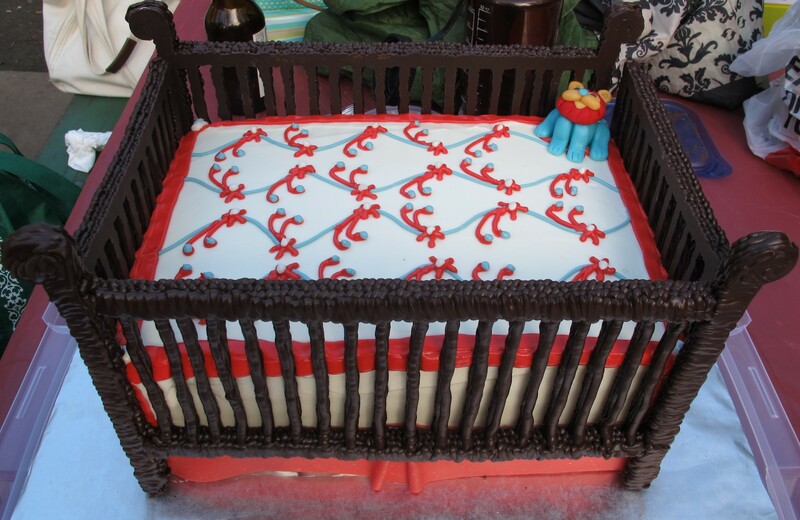 This time, for the crib posts, I tried a different method of piping out the chocolate. Can you tell? It doesn’t look like wicker this time around and I like the look of this much better. To get the effect, I squeezed to make dot, move out a little, and then squeeze again. I think I’m starting to get the hang of this. 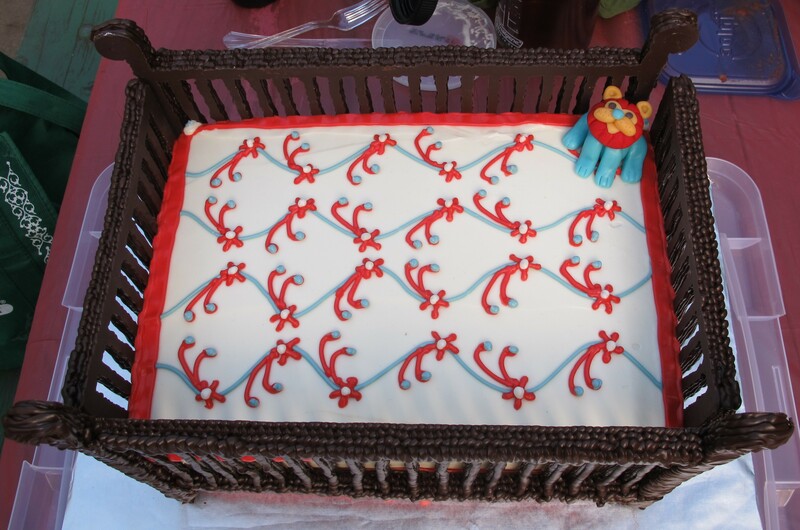 My next cake was for a friend’s baby shower (I think it was also in Jan.). Can you believe she and I had the exact due date of March 8, 2007 ? I delivered a week before and she delivered a week after the due date and we both had girls. 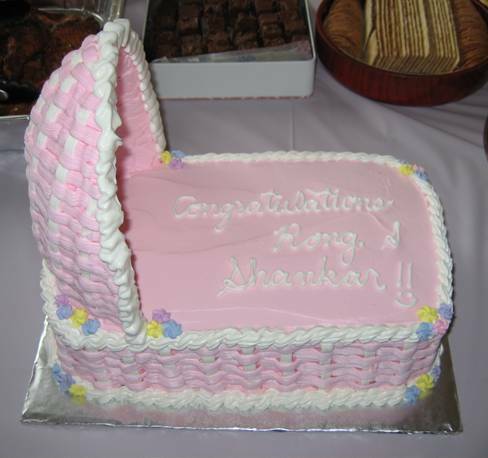 I decided to make a bassinet so I could once again practice my basket weave. 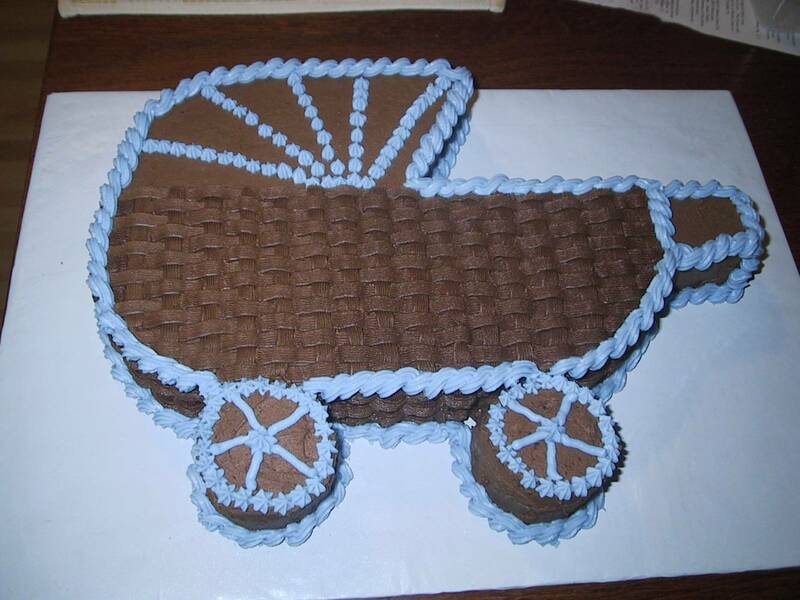 This time, I went ahead and used 2 different colors as I had originally wanted to try when I had made the baby carriage cake. Using 2 colors actually turned out well because it gave it more contrast. For the cake, I made a lemon cake with lemon-raspberry curd filling…mmmm real good! 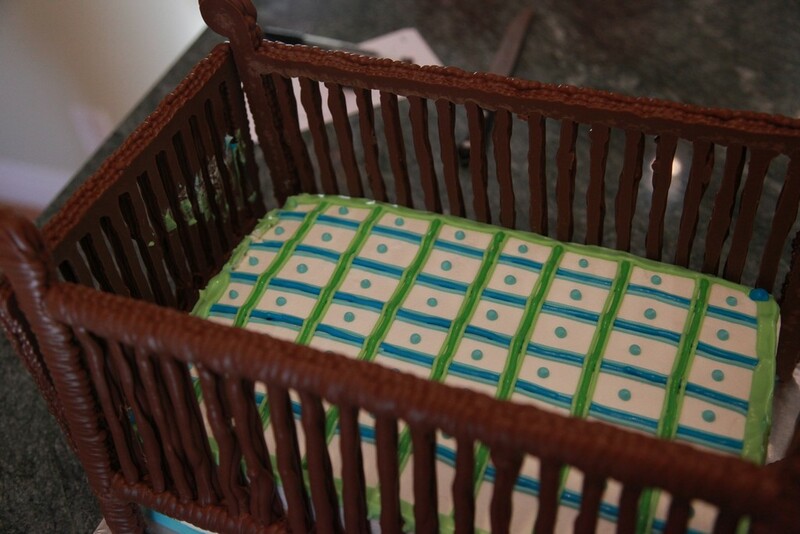 I made the bassinet cover using royal icing and an egg pan. Creating it was a royal pain! The first time I tried, I broke it! I used vegetable shortening to grease the egg pan and then put the basket weave directly on it. I had such a tough time prying the dried basket weaved cover off of the egg pan that it broke. I think my basketweave was too thin and hence fragile. The next time I tried it, I covered the egg pan with saran wrap and coated the saran wrap with shortening. I was able to lift the basket weave cover off of the egg pan using the saran wrap. This method, however, yielded a wrinkly texture inside of the basket weave cover. Fortunately, most of the attention was on the outside, so the inside was pretty much unnoticed to the untrained eye.